Overview Therefore encourage one another with these words: 1 Thessalonians 4:18 Essential Encouragement..Poetry With A Purpose is.. +Rare, Real and Relevant+Prophetic, Passionate and Powerful+Inspiring, Insightful and Interesting+Empowering, Engaging and Expressive+Transparent, Truthful, Testimony +Motivating, Moving, MeaningfulInside this treasure chest of essential encouragement is a collectio… n of jewels that are reflective poems and writings written in my heart under the influence of the Holy Spirit to be shared worldwide for such a time as now. It is my deepest desire that the words written in this book will be a ready reference and a solid source of Essential Encouragement for you. Lady V. Gods Daughter, She Speaks Encouragement. 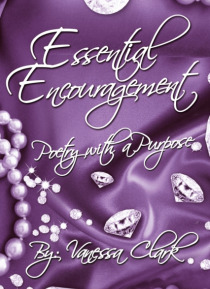 Vanessa Clark is a prolific writer, author, poet, encouragement specialist/coach and inspirational/motivational speaker, who has a gift of calming the troubled spirit. Her signature poem titled, I Am A Kept Woman was published in the March/April 2010 issue of Epitome Magazine. She speaks Words of Encouragement, Empowerment, Exhortation and Execution at numerous events nationally. In 2010, 2011 and 2012 Vanessa had the humble honor of speaking at the Gods Leading Lady Enrichment Program in Dallas, TX at the Potters House of which she is a 2010 graduate. Vanessa rendered a prophetic poetry piece titled G.O.D.S. D.I.V.A. Distinctively Divine and words of encouragement on helping a sister out.